WASHplus is helping communities in Kenya make the connection between healthy hygiene habits and improved sanitation and positive outcomes for people living with HIV and AIDs (PLHIV) and their families. A growing body of evidence indicates that preventable diseases such as diarrhea have a profoundly negative impact on quality of life and effectiveness of antiretroviral treatments for PLHIV. Diarrhea prevention begins at home with improved sanitation and feces disposal, water treatment, and effective hand washing at critical times. So does the prevention of HIV transmission through menstrual hygiene management, another key area that WASHplus is addressing at the household level. At the broader policy level, WASHplus is following work begun under its predecessor the Hygiene Improvement Project to help government and NGO programs in Kenya integrate improved WASH practices into HIV guidance and programs. WASHplus is assisting the government scale up of sanitation coverage using the community-led total sanitation approach that emphasizes latrine use and proper hand washing. WASHplus emphasizes inclusive sanitation options for mobility-challenged persons in the community—the elderly, chronically ill, persons with disability, and children. Working with multiple stakeholders, WASHplus is introducing behavior change incrementally and feasibly (including the use of our small doable actions approach) under the umbrella of Kenya’s community health strategy, helping to build a vibrant private sector to address demand for sanitation and improved WASH practices and introducing simple supportive technologies to vulnerable households. 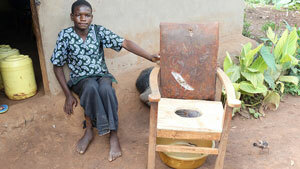 Latrine Options Expand Thanks to Artisan Training. | pdf version | The lack of sanitation spurs a community health volunteer on a personal mission to encourage people to build latrines. He links up families to a team of WASHplus-trained masons to construct or improve latrines. The Rail of Hope for Radio Technician. | pdf version | A nerve disorder transformed a gregarious man into a shut-in. With the help of a WASHplus-trained community health volunteer, he has a new latrine, built-in commode, and supportive rails that deliver the promise of improved hygiene and dignity. Delivering Crucial Support on the Frontlines. | pdf version | The WASHplus project has trained more than 300 public health officers across Kenya to integrate water, sanitation, and hygiene (WASH) messages into interventions for people living with HIV. The officials have, in turn, trained over 1,500 frontline community volunteers to help HIV-positive individuals practice good hygiene. Simple Actions Keep Patients and their Families Healthier. | pdf version | Maureen Awour, 37, is a single mother living with HIV in Kibera, a sprawling low-income settlement in Kenya’s capital Nairobi. Her health declined drastically late last year when she contracted meningitis and was hospitalized for several weeks. She is now recovering at home, but she is now bedridden and cared for by her sister Lynne Awour. Two Lives Changed with One Commode. | pdf version | Three years ago, Teresia Murugi, a mother of three from Maai Mahiu, Kenya, was diagnosed with spinal tuberculosis. She now walks with the support of crutches. Although doctors told her she may never walk again unaided, she believes that one day she will. Her strong conviction comes from improvements she made in the hospital after being bedridden for six months. Learn at School, Practice at Home: Early Childhood Development Centers Reinvigorate Improved Hygiene Practices. | pdf version | Schools often provide models for desired behaviors that we hope children will bring back home. While implementing a community-led total sanitation effort in Maai Mahu division, Kenya, the WASHplus project found that young children in early childhood development (ECD) centers were openly defecating at school. A String, a Jug, and a Bucket. | pdf version | In Kenya WASHplus and the Ministry of Health (MOH) are training community health workers and recruiting natural leaders to advance sanitation among vulnerable households. Using a small doable action approach, trainees work with households to make simple improvements to ensure all family members can access a latrine and a hand washing station. Community Volunteers Improve Hygiene for People Living with HIV. | pdf version | USAID’s WASHplus project is working with the Ministry of Health and community groups to promote healthy WASH practices alongside existing interventions for people with HIV and their households across Kenya. The project is building the capacity of Kenya’s public health system in WASH-HIV integration at all levels by training health workers in an approach that encourages small doable actions, which are feasible steps that move people towards an ideal behavior. Aug 8, 2014 - Ministry alarmed by ‘long calls’ along highways, to build toilets along Nairobi-Nakuru highway, Standard Digital. Nakuru County director of health Dr Benedict Osore with county public health officer Samuel King’ori and USAid's WASHplus project manager Evelyn Makena examine some chairs used for defecation for the disabled at Longonot village in Naivasha. He said that around 300 of the 1,949 villages in the county had been declared open defecation free. Integrating WASH into HIV Interventions and Advancing Improved Sanitation Uptake: WASHplus Kenya End of Project Report, 2014. (pdf, 1.3MB) - USAID’s WASHplus project helped communities and households in Kenya make the connection between improved sanitation, healthy hygiene habits, and positive outcomes for people living with HIV and AIDS (PLHIV), their families, children, the elderly, and other vulnerable households. WASHplus in Kenya Baseline Findings, 2014. This report presents the findings of a baseline survey that WASHplus conducted in 2013 in households with targeted vulnerable populations in three strata: peri-urban, rural, and semi-nomadic. A total of 3,211 households meeting specific eligibility criteria were visited in Kenya. WASHplus Kenya Program: Project Brief, 2013. (pdf, 473KB) - The WASHplus project in Kenya supports the Ministry of Health and its partners to integrate improved water, sanitation, and hygiene (WASH) practices into HIV policies and activities. The project works closely with communities, encouraging households to identify small doable actions they can take to improve health and prevent diarrhea. Integration Inspires Sustained Behavior Change and Innovation in Kenya, 2013. (pdf, 1.8MB) - This is a poster that was prepared for the 2013 Water and Health Conference, UNC Water Institute. As a national program, WASHplus developed a WASH-HIV integration kit in English and Swahili that includes a training manual, job aids, and teaching methodology to engage district public health officers and partner NGO institutions working with community health workers and communities to negotiate improved WASH practices with households. WASHplus trained almost 600 trainers who in turn are training community health extension workers and community health workers to introduce improved WASH practices to vulnerable households across the counties of Kenya using the small doable action methodology. Fact Sheet 1: WASHplus Program in Kenya: An Overview, 2014. Fact Sheet 2: Community-Led Total Sanitation: Naivasha Pilot Project, 2014. Fact Sheet 3: Towards Equity and Inclusion in Sanitation and Hygiene, 2014. Fact Sheet 4: Learn at School, Apply at Home: Working with Schools, 2014. Fact Sheet 5: Building National Capacity to Support Inclusive Sanitation, 2014. Fact Sheet 6: Resources to Support WASH-HIV Integration, 2014. National Sanitation Conference in Pictures: April 1-3, 2014. Promoting Improved Sanitation and Hygiene: A Poster, 2014.